Work at height safety poster will show on screen for download and we will email you a copy. They may seem innocuous – even funny -, but slips and trips are the most common type of workplace accident, and account for a third of all major injuries. Over 10,000 workers suffered a serious injury because of a slip or trip last year. Prevention is better than cure, and one of the best ways of preventing accidents is making sure that people are aware of the risks. 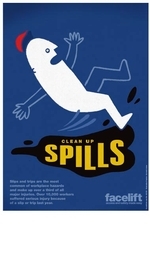 That’s why our poster this month shows our hapless health and safety character falling flat on his back because of a spillage that hasn’t been cleaned up properly.